While developing a turbofan for the Comac C919, China’s state propulsion company plans to scale up the core to create an engine for the Craic CR929 Sino-Russian widebody airliner. The company evidently aims to do this alone, since it is working on research hardware for the big engine despite the signing of a cooperation agreement with Russia last year. The C919’s turbofan, the CJ-1000, took a big step forward in the past few weeks with a hot test of a demonstrator engine. The propulsion company, Aero Engine Corp. of China (AECC), now aims at certifying the CJ-1000 in 2027 and putting it into service in 2030, about eight years behind the original schedule, says an industry source with insight into the program. The engine for the CR929 is the CJ-2000. Its schedule calls for demonstration of a core―comprising the high-pressure spool and combustor―to be completed by 2023. The CR929 is due to go into service no later than 2027 with a Western engine, probably a derivative of the General Electric GEnx or Rolls-Royce Trent 7000. Craic is a consortium of Comac and United Aircraft Corp.
do so with very little Western assistance, which is being withheld for fear of helping the Chinese military in an area where the nation is lacking. Giving the CJ-2000 an enlarged CJ-1000 core will avoid unnecessary development: Scaling is a tried and true shortcut, used for decades by the world’s major jet engine companies. Indeed, AECC is planning to do in reverse what GE did when it created the core of the CFM Leap-1 by scaling down from the GEnx. The CJ-2000 will need a completely new low-pressure spool, however, says the source. That engine and the CJ-1000 will both have 10-stage compressors and two-stage turbines on their high-pressure spools, but for the CJ-2000 the booster (or low-pressure compressor) will have fourstages, instead of three, and the low-pressure turbine will have seven stages, instead of six. 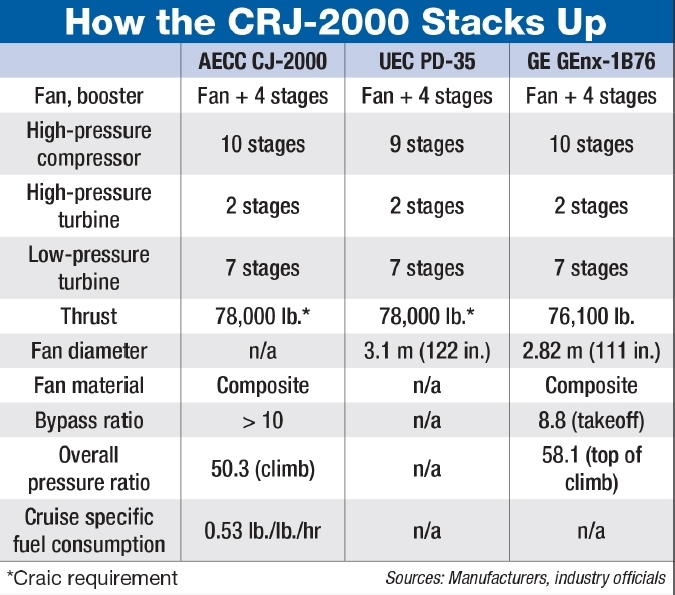 The stage counts for the CJ-2000 are the same as those for the GEnx-1B, used by the Boeing 787 (see table). Russia’s United Engine Corp. (UEC) plans to provide only nine stages in the high-pressure compressor of its proposed engine for the CR929, the PD-35 (AW&ST Oct. 2-15, 2017, p. 23). The CJ-2000’s technology will include composite fan blades and a composite fan case, says the industry source. Engine starting and powergeneration will be integrated. The bypass ratio is to be greater than 10, though that is only to be expected for a widebody-aircraft engine that would enter service after 2030. The targeted specific fuel consumption, 0.53 lb. per lb.-thrust per hour (lb./lb./hr), is a little higher than Craic’s objective for the CR929 of 0.525 lb./lb./hr. The CJ-2000 program has been launched, an AECC official told an aeroengine conference in Shanghai organized by Galleon in May. Whether “launch” amounts to the beginning of full-scale development, as would be understood elsewhere, is unclear; Chinese state companies are prone to exaggeration. high-flow fuel pump is also to be validated this year. It is unclear how much of this is also part of CJ-1000 work. Demonstration of such component technologies should be completed in 2019, when the four-year phase for validation of a core test rig for the CJ-2000 is supposed to begin. in China has already had an unhappy experience with such an arrangement, since the C919 was launched when development of the Comac ARJ21 regional jet was still far from complete. Even though the C919 is Comac’s second program, it will not be completed much faster than its predecessor. Comac now aims at making the C919 ready for service in 2021. The first engine for that airframe will be the Leap-1C. AECC is conservative in allowing three years between certification and the 2030 entry into service of the CJ-1000: A Western manufacturer would not normally need more than 18 months. Industry officials observing the program nonetheless believe that even the 2030 objective is optimistic. Still, at this stage any such forecast can only be a guess. When CJ-1000 development was launched in 2011 it was due to end in 2020�C22, but that never looked probable. operate it even if it is not economic. The industry ministry said in May that AECC had run the complete demonstrator engine, the CJ-1000AX, in a “recent” test, achieving 6,600rpm. That element of the program is due to be completed next year. The “CJ-1000 Series” is supposed to cover a thrust range of 22,000�C44,000 lb. For the CJ-1000B, intended for an extended-range version of the C919, thrust will be 29,500 lb., according to a brochure issued in 2017 by Galleon and probably based on material supplied by AECC. The engine company also has a concept for a CJ-500, with thrust variously proposed at up to 18,000 lb. or up to 22,000 lb. This would be a candidate as a second engine for the ARJ21. AECC was split from Avic in 2016. The unit handling the CJ-1000 and CJ-2000 is its Commercial Engine Co., formerly Avic Commercial AircraftEngines.